Duckworth and I are bent upon rowing up the Isis. It’s been a while since we’ve had our fair-weather outing, he being up to Liverpool on business. To break the tedium of our effort, he asks a question. He knows me. I give him the synopsis. The less-favored daughter of an old wife jumps into a well after a reel of linen thread she has dropped, knowing the punishment if she does not retrieve it. The maid wakes up in a flowered meadow. In this underworld she wanders until she comes to a bake oven from which loaves of bread call out to her, “Oh, take us out! Take us out! Or we shall burn.” This she does and travels on. She comes across an apple tree that cries, “Shake me. Shake me. My apples are all ripe!” The girl shakes the tree and piles the apples neatly. The maid performs her duties faithfully. Although well treated, well fed, and a thousand times better off than before, after a time she becomes homesick. “I’m pleased that you want to return home,” says Mother Holle, opening a door. As the girl passes through she is showered with gold coins that stick to her and is given back the reel of thread. When the door closes, she finds herself back home. The old wife sends her other daughter to throw her reel of thread down the well and follow it. In the underworld, she does not help the bread or the tree when they speak to her. She works well for Mother Holle for only a day, then slacks off. 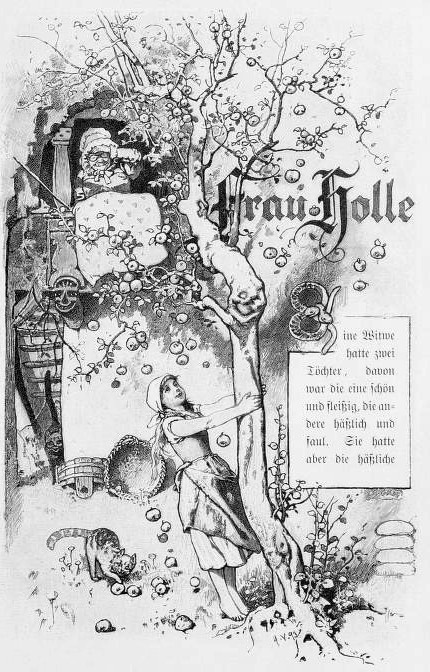 Mother Holle dismisses the lazy girl, who returns covered in pitch after passing through the magic door. She wears the pitch for the rest of her life. “First, there is Mother Holle. I remember my great-grandmother saying, ‘Mother Holle is making her bed,’ every time it started to snow. I thought her addled, and she was, but now I realize that remark must have come from somewhere. “Certainly you have,” I say. “Watered-down deity,” Duckworth chortles. “In this context that’s almost a pun,” and looks at me suspiciously. We row on in silence. Thalia turns the doorknob of Serious Books. Melissa left a message on the answering machine telling me that my copy of Hunt’s translation of Grimm had come in. I see them regard each other as they lightly touch hands. It strikes me they are of the same ilk, if decades apart. “Thalia, find yourself a book.” I gesture toward the shelves. She wanders off with a mission. “What is your take on such matters?” I ask, looking around to see what has become of Thalia. “Not exactly. The angel and devil speak of good and evil, giving it a religious cast. My thoughts don’t go there, though I see why others might. My struggles belong to me. I’m self-contained. I fight with myself on my terms, with no interference of another’s theology. I glance around once again, trying to spot Thalia. I walk by the aisles to check. The woman is psychic. Thalia sits cross-legged perusing a hardbound. Returning to the counter, I find Melissa’s pretty brows knit in contemplation. “Mine is a treacle well,” I muse. Thalia comes to the counter, gently but firmly placing her purchase on the glass casing. An unanticipated boon in owning a copy of Margaret Hunt’s translation of Children’s and Household Tales is that it has attracted our resident fairy. I thought the little creature had bonded with Thalia’s edition of Grimm, but apparently as long as the book is old the fairy will read it. I’d left the tome open to Mother Holle on the table and when I looked up from my terminal there she hovered over the book, her gossamer wings and floating black hair in a static-charged display. I know better than to try to talk to her. I turn my attention back to my terminal. The internet tells me Mother Holle or Hulda appears in Norse mythology as Hel, queen of the underworld and is likely of pre-Indo-European Neolithic origins. 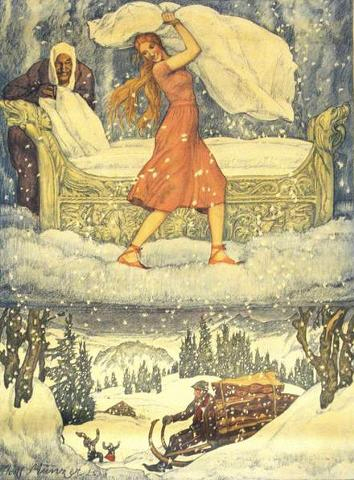 In early Germanic folklore Holle, a Sky Goddess, ruled the weather: sunshine, snow, and rain. The most tantalizing association is with Perchta, who dwells at the bottom of a well and taught man the craft of making linen from flax. She is also known as the Dark Grandmother, to whom go children who die in infancy. No one less than Jacob Grimm, in his more scholastic works, wrote about Perchta/Hulda in her two forms, Schönperchten (the beautiful) and Schiachperchten (the ugly). I must suspect the forms are reflected in the beautiful sister and the ugly sister of the Mother Hollestory. Just as interesting, I’ve run across a reference to Perchta wandering the countryside between Christmas and Epiphany, entering into homes, knowing which children had been good and which had not. The good received the gift of a sliver coin and the others had their bellies slit open, their stomachs and guts removed, to be replaced with straw and pebbles. Oh, for a simple lump of coal! When trying to grasp the stories of the gods and goddesses of any mythology as they have come down to us, we cannot think of them as consistent, thought-out works of literature. In my youth, I pored over the mythologies of the Greeks, Romans, Norse, and Celts trying to understand their message. The more I read, the less sense they made to me. I wanted their storylines to conform to a story arc, a familiar device, on a par with modern novels. The myths resisted. Now that I am old, baffled, and confused, the myths are more amenable to me. My model is to see myths (legends and fairy tales as well) as shards of glass from a broken mirror reflecting their images upon each other in a confusion of light and wisdom, over which history has cast the pall of Christianity, dimming their brilliance, giving us shadowy figures such as Mother Holle, once a sky goddess, now thrown to the bottom of a well. I look up from my terminal. The fairy is gone. I can almost doubt my senses that she was ever there, like details of a dream slipping away upon waking. My fairy, the gods, and goddesses are so ephemeral.